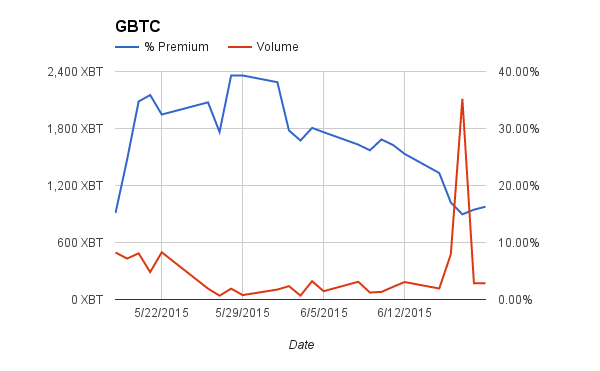 Leading up to the Eurogroup summit this past weekend, Bitcoin rallied on expectations of no deal and Grexit. Late Sunday night, Greece was humiliated on the world stage as Germany forced Prime Minister Tsipras to accept draconian terms in hopes of a bailout. Immediately Bitcoin dropped through $300 to $281. The price since has hovered around $290. Greece has until Wednesday to approve the measures in parliament. The European nations must come up with a 7 to 12 billion Euro bridge loan in cash to alleviate the crisis in Greece. The difficulty of accomplishing these two things is being underpriced by Bitcoin. There are some crucial questions that must be answered in a short amount of time. How will Tsipras argue the merits of the agreement when economics across the world believe the deal is terrible? Where will the money come from? David Cameron has said the UK will contribute no money towards a Greek bailout. To get cold hard cash from EU members will require domestic parliamentary approval. Will the ECB increase the ELA cap and allow Greek banks to reopen without capital controls? 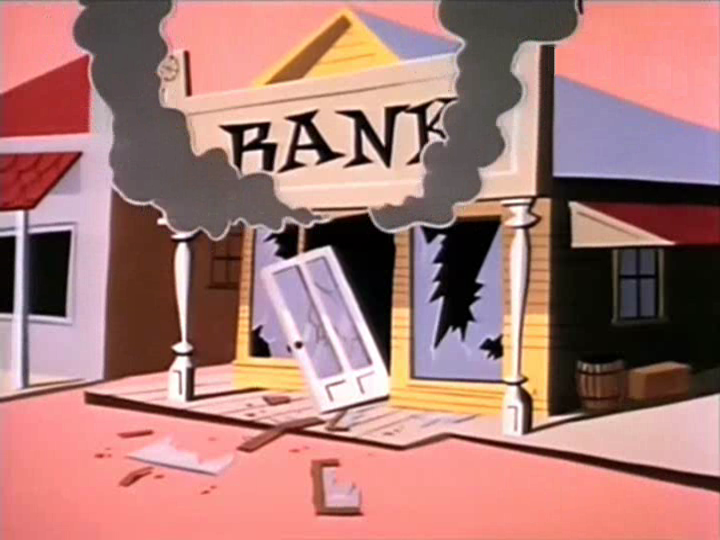 If Greek banks reopened, would depositors rush to withdraw their full balance? This is a big worry of the ECB, and probably why they have been very mum about increasing support for Greek banks. All of these questions must be resolved in under 48 hours. The market traded as high as $316 on Grexit fears. The longer Greek’s financial limbo lasts, the more lasting damage to their economy and population. Grexit even after the weekend “agreement” is even more likely to happen. Bitcoin under $300 is a buying opportunity. 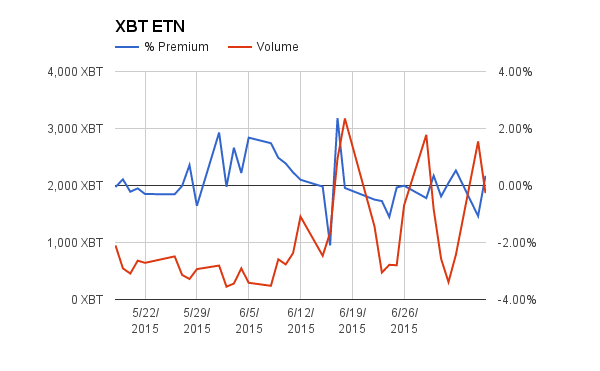 Consider buying XBTN15 (July) futures contracts to express this view. Greeks head to the polls this weekend to vote on whether or not to accept the now expired EU bailout package. 5 years of can kicking has finally come to a definitive vote on Greece remaining in the EU currency union. The issues and implications have been covered ad nauseam by countless blogs and the financial news media. No Vote: The bank run and capital controls will continue. Greece will attempt to negotiate further with the Troika, but the likely outcome is Grexit. Yes Vote: The bank run and capital controls will continue unless the ECB provides more Euro liquidity to Greek banks. A new government will likely be formed, and negotiations will begin anew. Grexit isn’t off the table, but the timeline is pushed further into the future. No Vote: Grexit becomes a very likely scenario, and global asset markets fall. Bitcoin sentiment improves as the misery imposed by capital controls and the shortage of goods continues. Positive price impact. Yes Vote: The capital controls will still be in place. 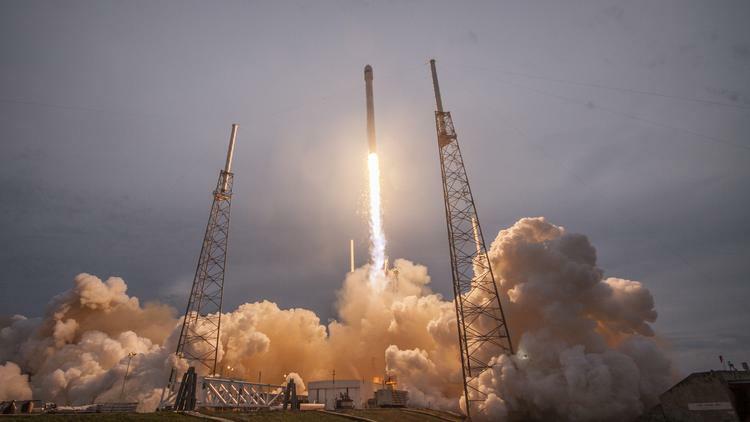 Global asset markets will rally, but could fade quickly as the facts on the ground will not materially change. This is the scenario that is priced into the markets currently. Bitcoin sentiment might be dampened somewhat, but the fact that capital controls will remain and the ECB still might not provide more Euros to banks means that the Bitcoin story begin pushed by the MSM will continue to gain ground. Neutral price impact. The second and more important development is the continuation of the crash in the Chinese equities market. This past weekend the PBOC launched a double rate cut (the one-year lending rate and the Reserve Ratio Requirement). The last time they did that was October 2008 on the heels of the Lehman Brothers bankruptcy. Investors didn’t play ball instead sending equites sharply lower on the week. The Shanghai Composite was down 10% on the week and closed below 4,000. Regulators are in full panic mode. The government ordered state owned news sites to only publish positive news about the stock market. [ZH] Many analysts expect the margin calls to continue as the various shadow conduits (Umbrella Trusts) of equity market leverage continue to unwind. Calls for additional easing from the PBOC (People’s Bank of China) and outright quantitative easing are growing. The addition of the global market turmoil surrounding Greece means that the PBOC will likely add additional easing measures this weekend. They like to announce rate cuts on Saturday or Sunday. Bitcoin will react positively from additional easing out of China. The Greek vote and the possibility of PBOC easing is the perfect setup for another Bitcoin rally over the weekend. After almost reaching $270, Bitcoin has retraced $20. The Greek vote is Sunday. Buy the rumour sell the fact. 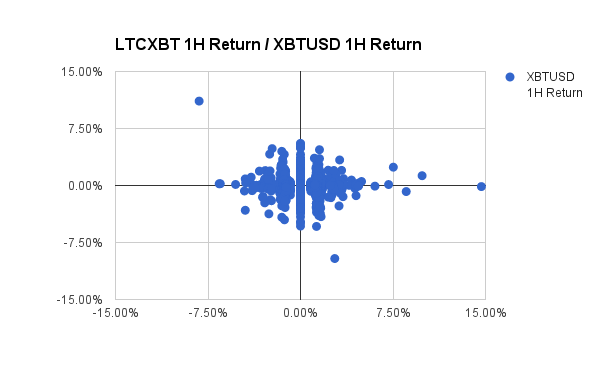 On Friday and Saturday, begin accumulating a long Bitcoin position with XBTN15 while spot is below $255. The Greek vote will be known Sunday night European time right before Asian financial markets open on Monday. That is the optimal time to close the position whether in profit or loss. We have been hard at work building a new simplified trading UI. The first version is available for comment onBitMEX Testnet. Please test the new interface and provide your feedback. We will launch the new UI along with our new higher leveraged contracts very shortly. If you like the current UI, it will still be available under the “Advanced” option. The hottest market in the past year has been the China A share market. The main indices are up over 100%. Millions of newbie traders are entering the casino with freshly minted yuan that they can now leverage. Chinese investors are being herded from one flagging investment (real estate) to the new and shiny equity market. At the helm of the SS. REKT is the PBOC (People’s Bank of China). Through various liquidity injecting programs and schemes, the PBOC has injected trillions of RMB into financial institutions. The money made its way to the stock market and the results are there for all to see. The universal force of gravity has taken a liking to the Chinese stock market recently. In the last few weeks the Shanghai Composite Index is down almost 20%. The PBOC heard the cries of newly rekt retail traders and responded with a monetary bazooka this weekend. For the first time since October 2008 (the beginning of the GFC), the PBOC cut both the one-year lending rate (0.25% to 4.85%) and the Reserve Ratio Requirement (by 0.50% for some banks). Forget Greece this is where the real action is. Money printing and the associated inflation never ends up exactly where central banks intend. The excess RMB liquidity won’t sit snugly in equities, but will find other financial assets as well. Bitcoin is one such asset that could benefit from a tidal wave of RMB free money. 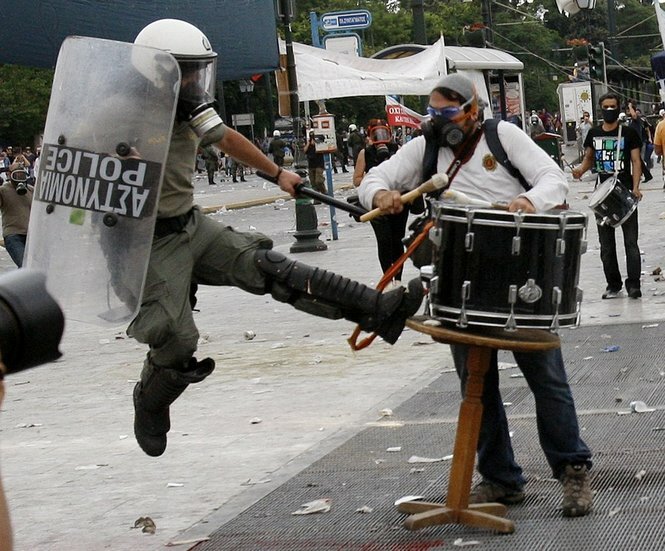 Greece is just a sideshow. The real action is happening in China. 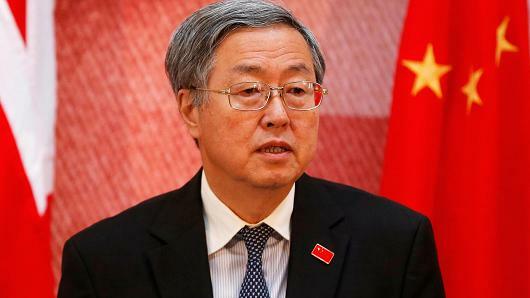 The PBOC is engineering a financial asset bubble in an attempt to mitigate the inevitable slowdown in the real economy. The effects on Bitcoin may not be immediate, but long term bulls should begin positioning for Chinese traders to once again fall in love with Bitcoin. 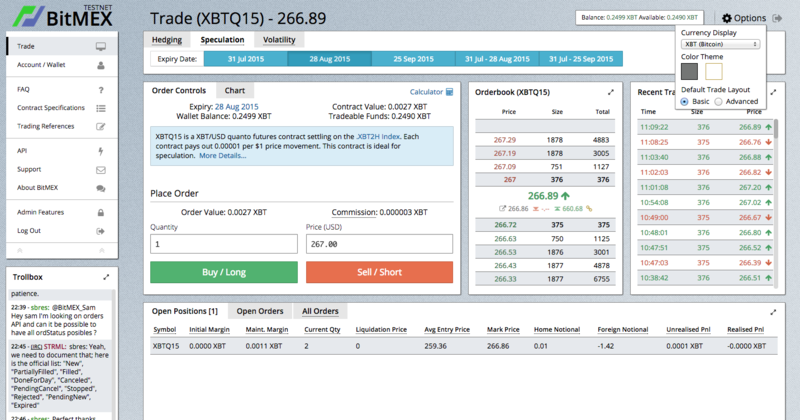 Buy XBTZ15 (25 December 2015) futures contracts. How Would A Greek Use Bitcoin? How would a Greek actually use Bitcoin? Now that capital controls are introduced many think it’s the perfect time for Greek citizens to adopt Bitcoin. Let’s analyse how exactly they could do that. Greeks can now only withdraw 60 Euro per day and outbound remittances are not permitted. The banks and stock market are closed today as well. Currently there are two types of Greeks. Those who got their money into cash or abroad, and those with deposits sitting in domestic banks. The unlucky Greeks with money still in banks are SOL. With no hard cash and no ability to wire money, there is little they can do to buy Bitcoin. Those who have cash and offshore Euro have options. Will Greeks buy daily necessities (gas, food, water etc.) with Bitcoin? Probably not because stores want Euros in cash. Stores need to pay for inventory and their staff, that is done in Euro not Bitcoin. Will Greeks use Bitcoin as a store of value? Maybe but if they already have offshore Euros, what urgent need do they have for Bitcoin. If they have cash, buying daily necessities is of more use than a store of value that can’t be exchanged for any real goods. 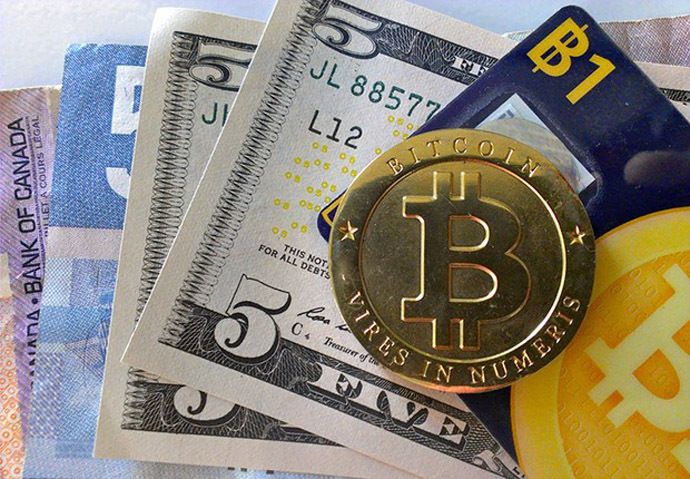 Will Greeks use Bitcoin to turn onshore cash into offshore Euros (buy Bitcoin, sell it abroad, remit Euro to an offshore bank account)? Possibly, this is the most likely use case currently for Bitcoin. There is one problem, who is going to sell it to them? Local Bitcoin sellers realise Euro once they sell their Bitcoin. They must recycle that cash back into Bitcoin to trade again. Outward remittances are not permitted, so it is effectively impossible for local sellers to replenish their inventory. Tourists are a solution to this problem. If you are planning a trip to Greece, buy some Bitcoin and then sell it locally in Greece at a huge markup. At a 10%-20% markup, a savvy tourist can easily pay for a substantial portion of their trip by selling Bitcoin. Will the Greek government use Bitcoin as their national currency? Keep dreaming. Greece needs to devalue its currency to regain competitiveness in Europe. That is not possible using Bitcoin. Bitcoin isn’t useful for Greeks who didn’t act early to secure their wealth. 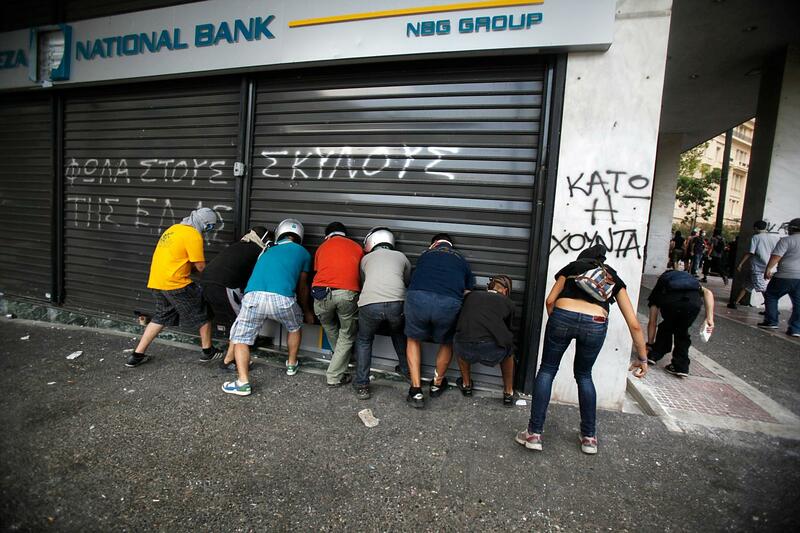 It isn’t very useful to Greeks who got their money out either. If Bitcoin rallies on Grexit, it is solely because traders believe others globally will re-examine how they store and secure their wealth and turn to Bitcoin as a possible alternative. 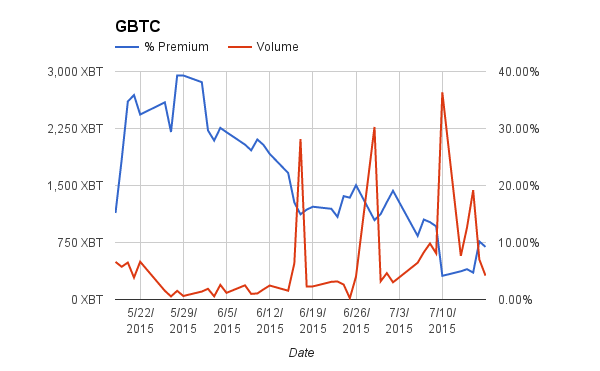 As the rally to $260 fizzled out, so did volumes on GBTC and XBT. Weekly ADV was down over 50% on both securities. 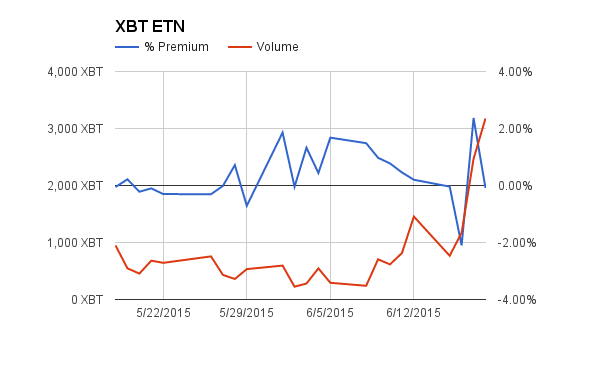 Volumes rebound on Friday as the Greece drama reached a new level of absurdity. The Greece EU bailout package referendum is Saturday. Volumes will recover as volatility returns to financial assets globally. The bombshell over the weekend was Greece’s decision to let the people decide whether or not to accept the latest EU bailout program proposal. Faced with real democracy, financial markets worldwide are in turmoil. The market expects voters to reject the EU proposal, which accelerates a possible Grexit. EURUSD opened down 200 pips, S&P 500 futures are down, and Asian markets are down close to 2% as I write this newsletter. All eyes will be on the European open, especially financials (here’s looking at you Deutsche Bank). Bitcoin has rallied $10 since the announcement, and now hovers at $250. From reading Reddit and many trader chat rooms, sentiment has improved. 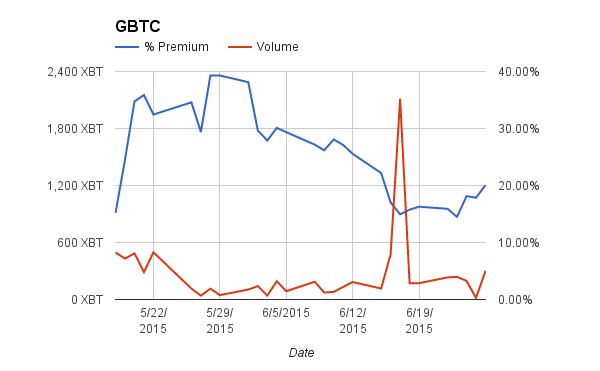 Traders are bullish and think the Greece turmoil will give Bitcoin a healthy bid. $260 is the all-important near-term level. To confirm the start of a real rally, Bitcoin must shoot through $260 on increasing volume. Another feeble attempt like last week, would be very negative in light of the positive sentiment currently expressed. 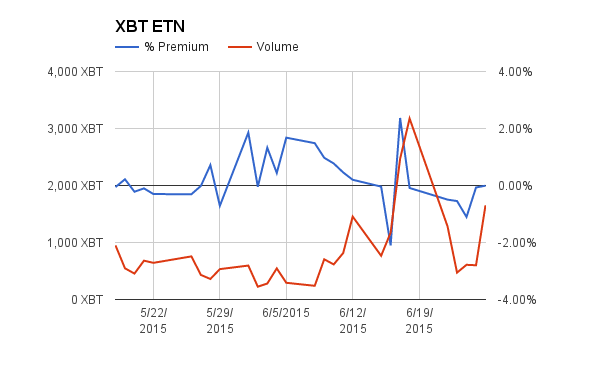 Buy XBTN15 while spot is below $255. If $260 is attempted on declining volume, close the position and go short with a $240 downside target.